Presto originally was used at Facebook to support data analytics needs which are open sourced later. Now Apache Presto is an open source distributed SQL engine through which Teradata offers support to Presto community. Presto is a distributed SQL engine which is used to perform query actions on even petabytes of data. Storage plugin interfaces and Extensible architecture are easy to interact with other file systems. Presto is being used for its low latency performance and interactive speeds by most of the industrial companies today. This section on Presto discusses on Presto architecture, configuration, and storage plugins. This section is prepared to professionals who are willing to make a career in Big Data Analytics. 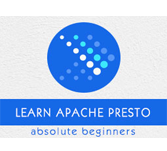 This section will give the user basic understanding on Apache Presto. Before heading into this article, user is expected to have a good understanding of DBMS, Core Java and any of the Linux operating systems.